History: 48 year old man with history of ERCP 3 weeks ago for gallstone pancreatitis presents with severe abdominal pain. Pancreatic Abscess: Single axial nonenhanced CT scan of the abdomen at the level of the pancreas shows a large collection of gas and liquid, which is walled off, in the area of the pancreatic bed. Note the gas-liquid level. Additionally, large volume ascites is present. This is was post endoscopic retrograde cholangiopancreatography pancreatitis. Note in the picture above, the patient has two calcified gallstones near the neck of the gallbladder. Recently it has been suggested that the terminology describing these cases be updated here. 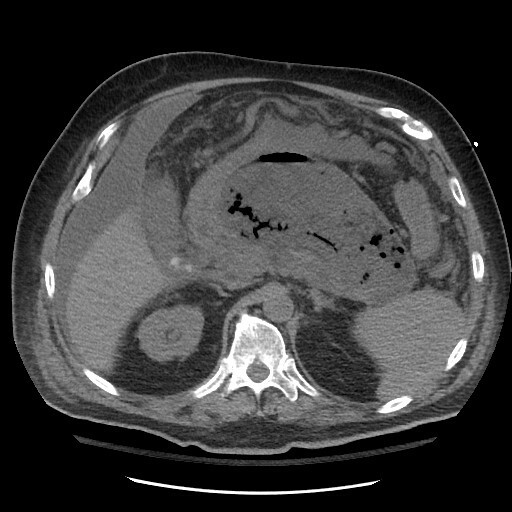 According to the Revised Atlanta Classifcation, this would likely be classified as a “walled of necrosis” of the pancreas, and previously it would have been called a pancreatic abscess. Look again at the image. Notice the gas-liquid level. Remember, during ERCP the patient usually undergoes sphincterotomy, as this patient did. It is possible that after the episode of acute gallstone pancreatitis, the patient developed a pancreatic psuedocyst and that the sphincterotomy effectively marsupialized the pseudocyst into the duodenum. In hindsight, this patient actually went on to surgery and extensive necrotic tissue was discovered in the pancreatic bed, lending the diagnosis of walled of necrosis.